Note: The characters apply to both sexes. distribution Mountains only, though perhaps into the Piedmont foothills; recorded from 9 counties. A northern species that ranges south only to the mountains of northern Georgia. abundance Rare to uncommon (at best). As most of the records with data are older than 20 years ago, it might now be considered rare. Fortunately, there were three records documented by photographs in 2013, but all from a single county (Watauga). flight The flight occurs in late summer and early fall -- from early August to the end of September. In Georgia, it also flies in August and September (Beaton 2007). habitat Mainly at fast, rocky streams in wooded habitats; however, recent records in Watauga County have also been at wet meadows and bogs. behavior As with Fawn Darner, it forages by flying along creek banks, apparently fairly slowly. However, that species occurs mainly along slow moving waters, whereas the Ocellated occurs along rapidly moving waters. 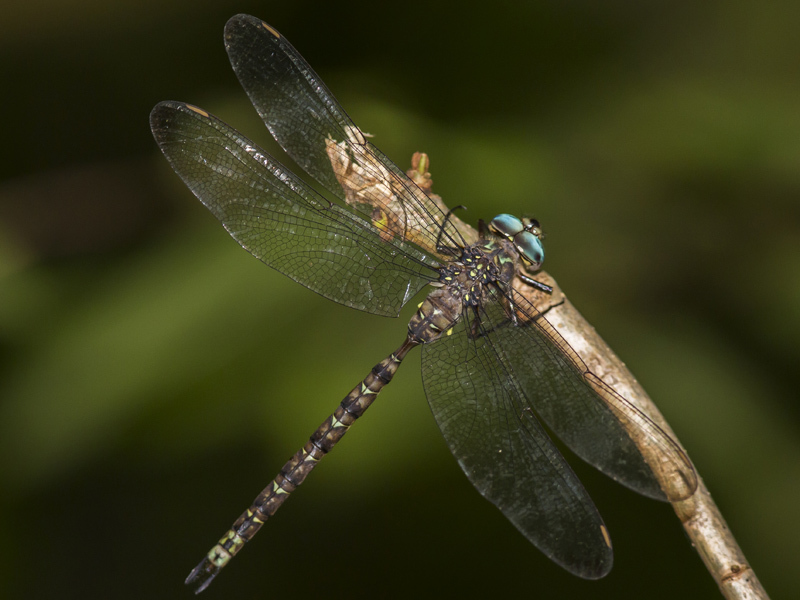 comments As there is relatively little odonate field work currently in the mountains, other than in the Asheville area, its range and status are not well known. Thus, the NC Natural Heritage Program wishes to keep records on it, and in November 2012 has up-listed it from Watch List to the Rare List, as Significantly Rare. Photos in 2013 documented the first records for Watauga County. More photos were made in Yancey County in 2017, though there is a vague, old report from this county. As there are records for five northern GA counties, it is disappointing that we have no recent records for any NC county in the southern half of the mountains. Photo by: John Petranka, Sally Gewalt. Chuck Smith. Comment: Yancey, 2017-09-19, South Toe River at Black Mountain Campground. - Male netted, photographed, and released. Others also appeared to be males, but can't be certain. Photo by: John Petranka, Sally Gewalt. Chuck Smith. Comment: Yancey, 2017-09-19, South Toe River at Black Mountain Campground. - Male netted, photographed, and released. Others also appeared to be males, but can't be certain.